Benchmark Media has been in the audio game for more than 25 years. And although they are best known for their DACs and ADCs, they have never been afraid to delve into new areas of product development. So the recent introduction of the new audiophile stereo amplifier, the AHB2 was a nice surprise but not totally out of left field. In fact, the company’s founder, the late Allen Burdick created a high-quality amplifier back in the 1980s, the DA101 distribution amp that was highly regarded for many years. The new compact AHB2 however, is a new design that takes amplification to another level in terms of measured specifications. 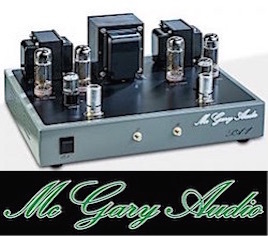 In fact, the performance of this new analog amp rivals the measured performance of its world class DACs. The amp is slated for dealers in early January 2014. According to John Siau, Benchmark’s chief designer and VP, the Benchmark AHB2 is a unique amplifier that was designed in conjunction with THX. 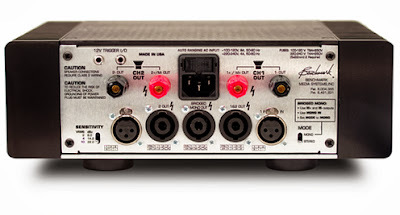 The bipolar-output, 100 WPC RMS analog stereo amp (350W bridged mono) is housed in a compact enclosure that measures two times a DAC2 (11" W x 9"D to back of connector x 3 7/8"H). Despite its modest proportions, the AHB2 boasts numerous design highlights that enable it to deliver measured specifications as good as its digital converters, especially its noise and dynamic range performance. I applaud Benchmark’s efforts to clean up analog amplifier noise. That low-level idle hiss that I hear from numerous vintage and modern amplifiers is, at the very least, annoying, and, at its maximum, detrimental to ultimate resolution. Siau said that the amp has exceeded his expectations in terms of measured performance. The SNR of the AHB2 was spec'd at 126 dB (A-weighted) and THD is -115 dB, just about as good as the DAC2’s measurements. “The AHB2 power amplifier was designed from the ground up to deliver the full performance of the DAC2 HGC," he emphasized. Siau furnished me with an Audio Precision System 2 measurement of the prototype AHB2 that I spent a few days with recently. The dynamic range was -130 dB, A-weighted! I don’t think I have ever seen (or heard) a hi-fi amp with such specs. Back in the 1980s, I remember sold state amps with a typical -85 dB dynamic range/noise spec. In order to achieve the new spec, Siau utilized THX amplifier design concepts, as well as applying some of his engineering prowess in order to get these impressive numbers, and as I found out in my brief listening sessions, impressive listening results. Siau said the following design highlights enabled Benchmark to create the AHB2’s “fantastic” performance signature. •The feed-forward design also improves damping factor for improved bass response, and the PCB uses balanced star-quad signal and power supply distribution to minimize magnetic interference. **Siau said that certain THX design elements allow him to make the amp as efficient as possible, but the AHB2 design was optimized for low distortion and low noise. As I got into serious listening of recordings, I was impressed by the AHB2’s "smooth factor. Although it uses bipolar output devices, its tonal delivery ease reminds more of MOSFET designs. Drum cymbals and the upper register of the Bernhard album’s piano sounded fantastic without any edge, grit or harshness. Siau sent me one of two ABH2 prototypes to conduct a few days of subjective listening in late October. He said that there would likely be a few more tweaks in the final version, but the prototypes represented the essential sonic signature of the design. The ABH2 is a simple amp to operate. It includes a front power on/off switch, binding posts (final version will have binding posts with easier access than the prototype’s horizontal-aligned speaker inputs), balanced analog inputs and a 12V trigger input. You can also bridge the amp to mono, via a rear toggle panel switch, to get 350 watts (8 ohms). Thus, buying two stereo amps and bridging mono for each one would be the chosen path for powering the less efficient speakers, or filling big rooms. Since the amp is not a high-gain amp, ensuring gain match with your source preamp is a consideration. 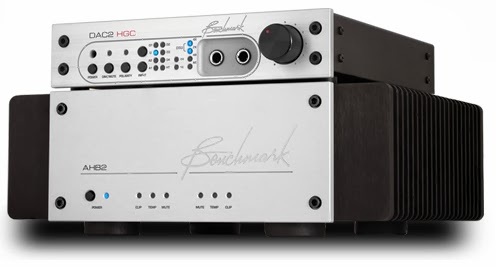 The Benchmark DAC2 HGC and DAC2 D have enough gain in the stock setting on various audiophile recordings. However, if you move a jumper inside the DAC you can get 10 dB more gain to give extra headroom. I played around with various gain components during my time with the AHB2, including the Coda preamp, Oppo BDP-105 variable balanced output, and the DAC2 D's variable output. Like the Benchmark DAC2 D, the Coda preamp was a better fit than the Oppo’s variable output. It had to be cranked a few more clicks on the volume control to get to the level of my normal amps, but they were still able to drive the Benchmark to plenty loud levels without noise. For those who listen with very accurate, discerning speakers, an extra 20 dB of lower noise could be heard — in terms of ultra detail that may be hiding in the noise of an average audiophile amp. Sources for the AHB2 listening sessions included the Oppo BDP-105, Benchmark DAC2 D, TASCAM DVRA1000 HD master recorder/player, and Apple Macbook Pro feeding a Mytek Stereo192-DSD DAC. Preamps included a Coda, a Pass Labs XP-10 passive preamp, Rogue Audio Model 99 tube preamp, and the line output of the Bryston BHA-1 headphone amplifier. Speakers included the Pass Labs SR1 three-way towers, MartinLogan Montis electrostatics (though the bass is handled in the speaker via a sealed powered subwoofer), Westlake Audio Tower 6, the best sounding Westlake hi-fi speaker and a pair of Westlake LC 8.1's and the ever-popular Legacy Studio stand-based small speakers. All interconnects were furnished by WireWorld. Speaker cables were courtesy of Alpha Core; Essential Sound Products provided the AC distribution gear including the Essence II passive power strip and several Essence II power cords that give clamp like connection to the wall and low-noise shielding. 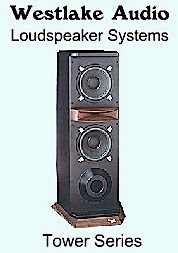 The AHB2 was first mated to the Pass SR1 tower speakers, the company’s entry -evel tower, which is an excellent three-way (review in just a few weeks) with quick, deep bass and silky top end. First up was the Warren Bernhardt — So Real SACD, a recording that has a full dynamic range and spacious soundstage with piano, drums and bass. I connected the Oppo BDP-105 XLR balanced output to my CODA preamp. Because of the prototype amp’s low-gain only setting and a Benchmark caution that preamps need to have abundant gain to drive the amp, I was curious as to how the various preamps would fare. Because the Bernhardt recording was recorded live-to-two tracks, its vast dynamic range is quite apparent, which means the quiet parts are quiet, and the louder parts are, well loud; thus, if you want to hear it loud, especially the softer parts, you got to crank it up a bit with this amp. I am happy to report that the Coda’s gain structure matched up well with the AHB2. I had to turn it up a few more clicks on the volume control, but there was plenty of level without noise. The first thing I noticed with the AHB2 is the lack of idle noise. Put your ears to the tweeter and none of the low level hiss you hear with conventional, high-gain amps can be heard. With no signal, nary a whisper from the Benchmark even when cranking up the CODA (or other preamps as I later discovered). As I got into serious listening of recordings, I was impressed by the AHB2’s "smooth factor. Although it uses bipolar output devices, its tonal delivery ease reminds more of MOSFET designs. Drum cymbals and the upper register of the Bernhard album’s piano sounded fantastic without any edge, grit or harshness. The dynamics of the So Real recording jumped out at me when listening to the AHB2 — with a deep, wide stereo image and an encompassing presentation of the subtle layers of each instrument and their ultimate interaction with each other. 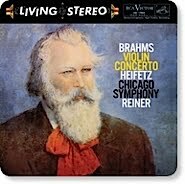 This quality was repeated through numerous other recordings as well. On the Gene Bertoncini — Body and Soul SACD, the warm, percussive guitar tones shone with this amp producing a wide spread of plucked notes. The low noise floor of the AHB2 however, was swallowed up by the recording's tube mic noise, but still the expansive stereo image and nylon string guitar’s dynamics were up there with the best amps I have auditioned. Switching to the MartinLogans and using the Benchmark DAC2 D D/A as a preamp with high-res PCM digital sources, the AHB2 again revealed its dynamic, clean, quiet character. The exquisite layers produced via the MLs were even more in evidence with the AHB2. The Tuck and Patti — With Love CD has a unique blend of vocal and guitar interplay that is mixed in a focused, yet open character. The Benchmark brings out the quick, percussive guitar attack with amazing clarity, but no over-the-top edginess that lesser bi-polar (and even some MOSFET amps). As impressed as I was with the perfectly proportioned midrange and top-end and the spacious layers of detail, the prototype AHB2 did exhibit an occasional denseness when playing mid bass-tinged pop music compared to the other amps driving the same speakers. I do not hear this plumpness with my demo amps, such as the Pas X350.5 or the Bryston 14BSST-II, or the ultra accurate Rogue Audio Medussa digital tube/hybrid. Is noise a noise, if you can’t hear it? In discussing Benchmark’s impressive amp specs with several audio industry insiders, several of them questioned the necessity of an ultra low-noise floor/ultra dynamic range in the amplifier chain. Does it matter if there is some idle hiss after the music starts to play? And can one hear the enhanced quietness versus an amp that measures, say -100 dB? I look at it this way: line sources, DACs, players, etc. have exhibited generational improvements in measured performance, and I believe these improvements have brought progressive audible, if subtle, improvements as well. 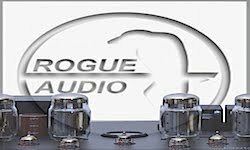 For those who listen with very accurate, discerning speakers, an extra 20 dB of lower noise could be heard — in terms of ultra detail that may be hiding in the noise of an average audiophile amp.The -130 dB noise/dynamic range just gets us that much closer to the live music signature that we yearn to hear from our beloved electronics. So, at the end of the day, I applaud Benchmark’s efforts to clean up analog amplifier noise. That low-level idle hiss that I hear from numerous vintage and modern amplifiers is, at the very least, annoying, and, at its maximum, detrimental to ultimate resolution. I can’t wait to hear the final version of the AHB2. John Gatski is publisher/owner of the Everything Audio Network. ©Articles on this site are the copyright of the Everything Audio Network. Any unauthorized use, via print or Internet, without written permission is prohibited. Are you getting the final version in demo? 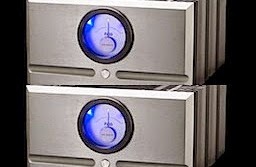 I'am considering this amp to drive my Martin Logan Summit X's, at least test drive is coming. Win A Parasound Z-Phono Preamp! •Check Out Our Guitar Review Site! Engage Your Hi-Res Music DAC! More Preamp Choices From Bryston! Supreme Accuracy At Any Power Level! Audiophile DAC From The Digital Pros! 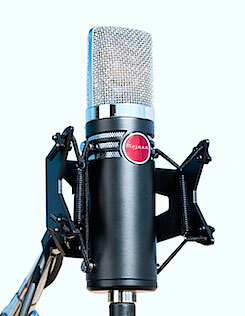 David Royer's Latest Recording Mic! A New Low From ML Subs! Get New EAN Review Links Via Email! Sign up for EAN email delivery of new review links and giveaways: Click here! Belt-Drive Turntable With Digital Out! Generation 3 MRX Receivers Now Available! "The New .8 Amp Series"
It's Good To Be King! Like Guitars? Check Out EGN! Interested in web buttons or banner ads on this page? Click here to request rates for the Everything Audio Network.